Get to know us — we’re the used RV dealers that connect customers with fun and fully-equipped motorhomes at super low prices. When vacation time rolls around where do you like to go? Perhaps you’re getting into a rut and want to explore new and exciting places. Don’t put off your exploration for another day — Pedata RV Center offers you a fun and budget-friendly way to buy top quality used motorhomes online. With over two decades of experience in the RV industry, Pedata can help you find the perfect RV for fun trips close to home or sojourns across the country. 1) 2013 Fleetwood Bounder Classic 36R w/3slds – Great price on a bath and a half diesel Bounder. Amenities include furnace, air conditioner, convection microwave, generator, HDTV, power awning, sofa bed and more. 2) 2011 Holiday Rambler Augusta 29PBT w/3slds – Super clean B+ with only 8217 miles and 14 hours on the generator. Beautiful kitchen and bath, furnace, air conditioner, generator, dinette bed, HDTV, tinted windows, day/night shades and much more. 3) 2009 Gulf Stream Crescendo 40K w/3slds – Must see deal for the serious RV buyer: Furnace, air conditioner, washer/dryer, generator, HDTV, Corian countertops, pleated shades, power entrance step and much more. Our inventory is constantly being updated, but the above RVs are an example of the quality used motorhomes we offer. We encourage you to shop for your RV online on our site, then schedule your free, live tour which will allow you to direct one of our representatives as they point the video camera wherever you like; you’ll get the full view of what your favorite RV really looks like. Once you find the motorhome that fits your needs, a quick trip to our Tucson, AZ dealership will allow you to see it in person and seal the deal. We even pay up to $500 towards your airfare when you buy with us. Add these savings to our great used RV prices, plus incredible financing from Pedata, and you can potentially save $10,000 or more over what you might pay if you bought your RV locally. It’s time to go exploring. 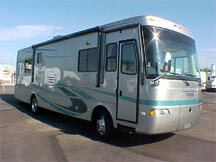 Start your journey off right with a great used motorhome from Pedata RV Center.